No attempt to describe this unbelievable event can come close to the actuality of the Oshkosh experience, and I will not try. I attach a few photographs of the EAA 322 members who attended this year's extravaganza, and the faces will tell the story without needing any words. However, for me personally, the highlight was getting to fly an AH-1F Cobra Attack Helicopter, and I am still on a high, 2 weeks after the event. It all started when I got chatting to Bruce Whitley of the Army Aviation Heritage Foundation. This organisation exists to inspire American soldiers through the maintenance and operation of historical aircraft by veteran airmen & women, and in this case, the Hueys and Cobras of the Vietnam conflict. Whilst drooling over the Cobra on display at Oshkosh, I learned that the foundation would be offering flips in both the Huey and Cobra from nearby Fond du Lac Airfield on the following day, so bright and early, I took a taxi down to Fond du Lac. I "established my credentials" with Bruce, the first pilot for the day, by showing him pics of my Alo and Gazelle, and giving him a little of my background, and then paid my bucks for the first ride of the day in this awesome machine. 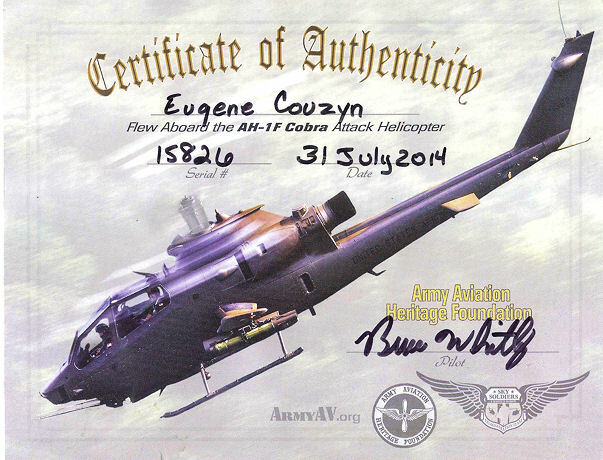 Turns out, Bruce was a Vietnam Cobra Veteran with many missions under his belt, but had also actually flown a Gazelle in a different theatre. My flight started out in the front seat of #15826, with Bruce making a mock attack on a small farmhouse near the airfield, and I came under close scrutiny through the mirror set up to reflect the passenger's face to the PIC in the rear. I must have passed muster, because when I asked to be allowed to take the controls, I was able to repeat the exercise over and over, with each successive dive getting steeper and steeper, until we were all but vertical in our attacks on the long suffering farmers in the area. I then carried out a sortie down a nearby winding river, strafing the "gooks" with our machine gun. Man, I get all shaky just re-living the flight, with the realisation that this had to be the most exciting flying experience of my life. Sadly, I then had to return to the airfield, where Bruce landed, to take on the next passenger. To the amazement of the organisers, I returned a short while later for a second and third flight, getting more and more comfortable with the machine on each successive flight, and finished off with a low level high speed pass down the Fond du Lac runway, a steep climb, wingover and second pass in the opposite direction. President of the organisation, Ed Clarke, presented me with a Demonstration Team Tee shirt and cap, and I look forward to wearing them at future events. All too soon, it was all over, but the memory and 0.9hr entry in my logbook are there forever.